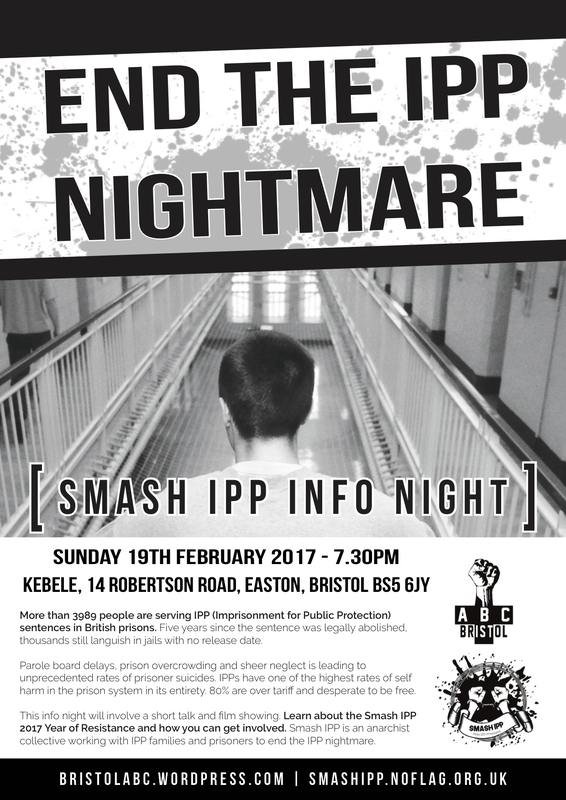 Sunday 18th February, Smash IPP infonight! A s anarchists, we often have aims that seem unachieveable. A truly peaceful and democratic society? Maybe not in my lifetime. But sometimes there are differences that we can make. So if you’re tired of fighting uphill battles, Smash IPP has an idea for you. Thousands of people are serving IPP sentences with no release dates in UK jails. The law that put them inside indefinitely has been abolished, but they’re still in there, with the uncertainty having such a devastating effect on their mental health that over 50% of them self-harm. Come to Kebele Community Centre in Easton at 7pm after dinner to find out more about these forgotten prisoners and how you can help with the 2017 year to free all IPPs! We don’t see this as incongruent with our aims of prison abolition, more as a reduction of harm to vulnerable people. Anything that reduces the power and reach of the prison-industrial complex is fine by us. May 1st celebrates international workers’ day with rallies, marches and events staged by workers all over the world. Texas prison slaves join this celebration behind prison walls, in recognition that out of the death of plantation slavery in the United States, the 13th Amendment, U.S. Constitution, was enacted in 1865 legislation legalizing slavery “as a punishment for crime”, becoming THE NEW JIM CROW of mass incarceration of the poor, mainly of PEOPLE OF COLOR who are disproportionately represented in the U.S. Prison Industrial Complex, a $2 billion a year industry sustained with forced labor of our nation’s prisoners without due compensation. It is this historical awareness that has become the motor force of prisoners in Texas, Alabama, Mississippi, Georgia, Virginia, North Carolina, California, Washington, Oregon, among other states, of prisoners rattling their chains of slavery protesting inhumane prison conditions, institutionalized racism, legalized prison slavery and the repeal of the 13th amendment. The prisoners’ movement for human rights, and for human dignity do not end with admission into the prison system, for whatever reasons landed them in prison in the first place. Workers on the outside must support the just demands of all prisoners in linking these struggles – which are one and the same. Further, this year also marks the 130th anniversary of the May 4, 1886 rally at Haymarket Square in Chicago, called to protest a police riot the day before. Socialists and anarchists joined hands in protest and were framed up and executed or sentenced to life in prison for the explosion of a police-planted bomb at the May 4th demonstration, to justify a police assault on the protesters and to repress the activists, and destroy their movement by use of extrajudicial means by the police. We celebrate the HAYMARKET SQUARE MARTYRS who were pioneers of the movement for the 8-hour work day, and who stood for workers’ rights. TODAY, MAY 1, 2016, we urge all INDUSTRIAL WORKERS OF THE WORLD to unite and to fight for a shorter work day, for better wages, working conditions and for other workers’ rights, until the ultimate abolition of wage-theft slavery of global capitalism, its imperialism and corporativist fascism, and for the universal emancipation of labor from the chains of capital, and our total social, human liberation as a free people, without capitalist slave masters with the means of production in workers’ total control. WORKERS’ STRUGGLES, PRISONERS’ STRUGGLES, ONE AND THE SAME! 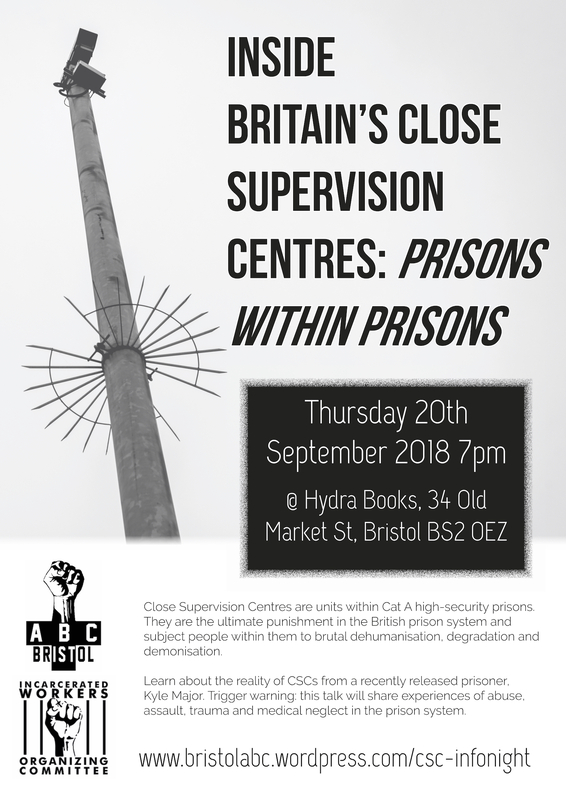 DEFEND WORKERS’ RIGHTS, PRISONERS’ RIGHTS! INDUSTRIAL WORKERS OF THE WORLD, UNITE! BREAK THE CHAINS THAT MAKE US SLAVES! In its mad race for profits, capitalism throws more and more people into precariousness and makes our environment increasingly unlivable. Faced with scolding anger and misery sown into anything that goes, the state invests in maintaining order and builds new prisons.